1. In a small bowl mix together the whole wheat flour, baking powder, salt and pepper. Add in the diced up butter and incorporate, with your hands or a fork, a bit into the dry mix. It should look like a course crumble or pea sized flour covered butter. 2. Stir in the buttermilk until just incorporated. You want to make sure not to overwork the dough. Once most of the flour is absorbed into the dry mix remove from the bowl and place on a workable surface. 3. Gently work the dough together into an approx 3/4 inch high round. Using a glass, mason jar or cookie cutter to cut out your biscuits. Work any remaining dough gently back together to continue making the biscuits. I got 10 nice sized biscuits. 4. Place onto a lined baking sheet. 5. Pop into a 450 degree over for 10-12 minutes until the biscuits are cooked through and golden brown. 6. Lets get to the gravy! You can start this while those fabulous biscuits are baking. 7. In a large saute pan, over medium heat, add the olive oil and sausage. Using a wooden spoon break up the sausage as it cooks. Once cooked most of the way through stir in the flour to coat. 8. Reduce the heat to low and add in the milk. Allow to simmer, stirring frequently, until slightly thickened. Season with salt and plenty of black pepper. 9. 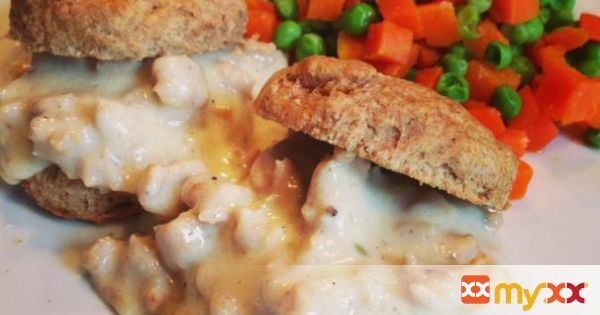 Pour that delicious sausage gravy overtop the biscuits and enjoy this lightened up southern classic!